Judith, who was on the judges’ panel for the design challenge, attended the awards ceremony which was held at the Ontario Science Centre. It was a great evening of sharing and applauding the winners. The designed ecosystem in the community gallery had to be visually appealing and memorable for gallery users; it had to be functional, easy to maintain, operate consistently and fit into the gallery environment and the day to day use of the gallery space. The judges were looking for a beautiful space that was conducive to health, happiness, providing diversion and promoting relaxation for gallery visitors. The build budget was $20,000 with low ongoing running costs of no more than $250/month. The entries were judged on the basis of many factors including satisfaction of functional objectives, aesthetic integration, buildability, ease of maintenance, clarity and impact of team presentation and budget control. 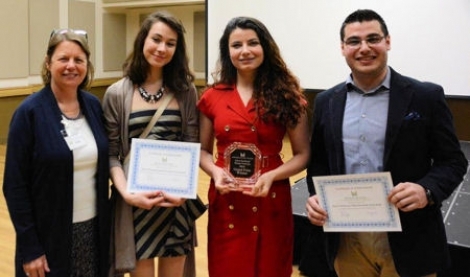 A team made up of Emma Christensen, Rami Dawood and Arasta Kadir, 3rd year students at Humber College, won the Community Center Gallery Design category and went on to win the grand prize. Their winning design brought together the required ecosystem components in a creative, impactful and interactive way. Upon entering the gallery, visitors will be able to view and interact with three translucent globes – one globe is a freshwater ecosystem, another is a biochar compound growing organic strawberry and pea plants and the third is an air filter. The winning team explain their design approach here YouTube video.